Does my elementary school-age child need to have had Montessori preschool experience in order to enter Summit at first grade or higher? No, a Montessori preschool background is not necessary to be admitted to and succeed at Summit. Once here, new students readily learn how to use the Montessori-based materials used in the classroom. 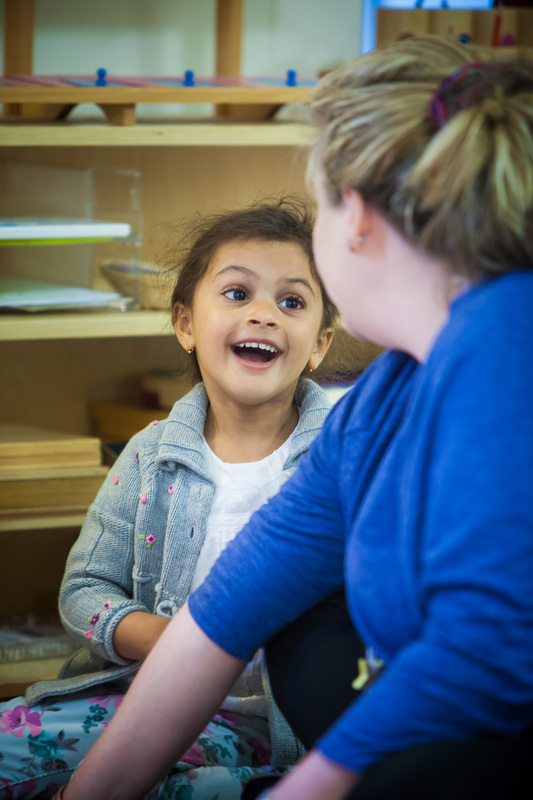 How can I be sure that my child will feel comfortable in a Montessori classroom? Come visit! Our classrooms are child-centered and that is easily recognizable to all students. All applicants will have the opportunity to visit Summit and spend time in the classroom appropriate to the grade-level they would be entering. Is it true that students select their own work? Students are involved in active choice-making at all levels of our program. This supports the development of self-directed learners who engage deeply in the process of their learning. It boosts concentration, motivation, and helps students to take responsibility for their work. That having been said, our Montessori environments are not totally free-choice classrooms. For younger children, choices are shaped by the materials that are present in the environment and by the teachers’ perceptions of a student’s readiness for a given material or lesson. Older students take responsibility for managing their time through completion of “work plans” that guide the student toward challenging activity in all areas of the curriculum, but also allow the learner to choose how and when s/he will complete a given task. With choice comes responsibility, and this responsibility builds as each child develops. Read more about our program here. How is physical education integrated into the program? Physical education is part of the Kindergarten, Lower Elementary, and Upper Elementary curricula on a weekly basis throughout the academic year. Our program provides for seasonal activities and is reviewed annually. Past activities have included Frozen Ropes, yoga, and martial arts. In addition, all students participate in outdoor recess on a daily basis, weather permitting. How do students transition from elementary school at Summit to public and private middle schools? When students graduate from Summit, they are well prepared for further studies. In nearly a dozen years of graduations, our students have successfully transitioned to a variety of public and private schools. Among our graduates are National Merit Scholars at the semi-finalist and finalist levels as well as recipients of National Latin Exam honors, humanitarian and writing awards, art awards from the Small Independent School Arts League, and a special citation for outstanding musicianship from the International Association of Jazz Educators. Visit the Summit Alumni page to see where students go after leaving Summit. Does Summit have a cut-off date for Kindergarten like many schools in the area? follow their guidelines of respecting the September 1 deadline for turning five before entering Kindergarten. Those students who are three when they begin in Children’s House will be five by that date. Those entering before three years of age may spend an additional year in Children’s House. The classroom has materials for math, language, and cultural studies that allow children to explore up to a third grade level, students are always challenged and allowed to progress at their own rate. Does Summit provide foreign language instruction? Foreign language instruction at Summit begins at the age of three with Spanish. Our Spanish teacher goes into the Children's House classrooms to teach these young students. Beginning in Lower Elementary, the children participate in Spanish twice a week. They are placed in groups based on their experience with Spanish. Could you describe Summit's art and music programs? Summit integrates both visual and performing arts into the classrooms as well as in separate classes with a team of dedicated specialists who mentor our students. Beginning at the age of 3, all students participate in music each week. Upper Elementary students are also part of the Summit Band. Beginning in Kindergarten, all students have art class each week. Additionally, elementary students can choose to go to Studio Art on particular afternoons each week to work on projects that will be included in their independent research presentations. Each spring, Summit hosts a Night of the Arts when students perform in a play that has been written by the Upper Elementary class. Does Summit offer extended care and after-school enrichment classes? Yes. Summit offers both an early care and after care program each day. Early care is available from 7:30–8:15 a.m. and after care is available from 3:00–6:00 p.m.
After-school enrichment if offered on a trimester basis. The classes offered each session rotates throughout the year. Current offerings include: 3D Art, Gardening Club, Bricks for Kids (Lego®engineering), and yoga. Piano and guitar lessons are also available after school by arrangement with the teacher. Yes, we are very fortunate to have Sue Ackerman serve as our school nurse. She is on campus each day from 10:00 a.m. to 1:00 p.m. She not only monitors the general health and records of the students, but also provides hearing and vision screenings. She teaches our health curriculum to Upper Elementary students and gives lessons to all students on oral health, nutrition, and the importance of good personal hygiene.